Come dine with us soon - and enjoy truly affordable quality sushi! Our title of "best sushi train in Southeast Portland" is uncontested... and starting at $1 per plate, your wallet and stomach will thank you. Thousands of repeat customers love our quality and prices! Say Hi while you're here! The Best $1 Sushi This Side of the Willamette! Sushi on a budget has never been better! Sushi Sushi takes this popular cuisine to a new level. You have probably heard for years that low prices mean sacrificing quality. At our Portland sushi restaurant, located conveniently at 82nd & SE Foster, our sushi train will help you save money without giving up freshness or taste. 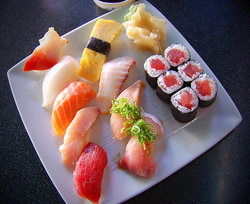 Our plates of sushi will have you coming back for the best sushi Portland has to offer. Great for an affordable snack or meal, Sushi Sushi can satisfy your craving, filling your stomach without emptying your wallet! Want to discover the best dish at Sushi Sushi? Click to see the menu & the charlie special!